Emmett Kelly's most popular skit involved him coming out to sweep the ring between acts. While doing so the spotlight would begin to slyly follow him around the ring. After some bemused frustration he would sweep at the circle of light cast by the spotlight making it smaller and smaller until he could then sweep it under a rug or out of the tent. Versions of this skit live on to this day and its another example of something so familiar that I never even stopped to consider who first came up with it. I've had a lot of moments like that with this series. 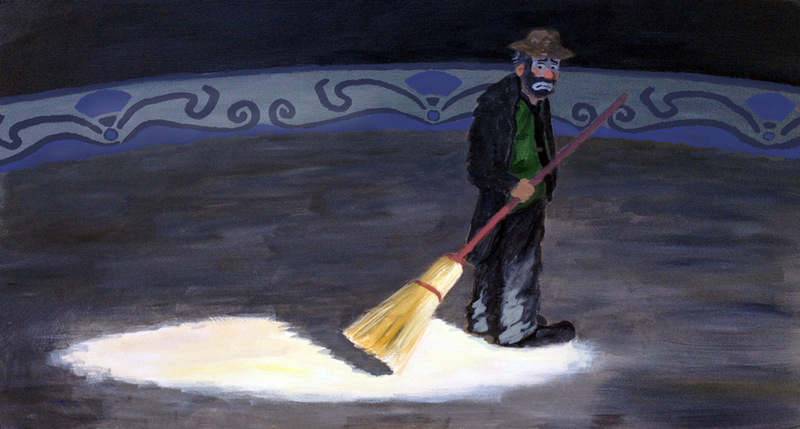 This illustration is for the Notable Missourian book on Emmett Kelly, written by Donald McManus and published by Truman State University Press.